Happy Friday, everyone! Today I have an older mani I did to show you all! I knew I had to have it! The glitter is so fun and unique. Here I have it over China Glaze’s Galactic Gray, a polish with a slightly holographic finish. On my ring finger, I used a makeup wedge to sponge the glitter on for easier application. I finished it all with a glossy top coat. I love pulling out oldie glitters. 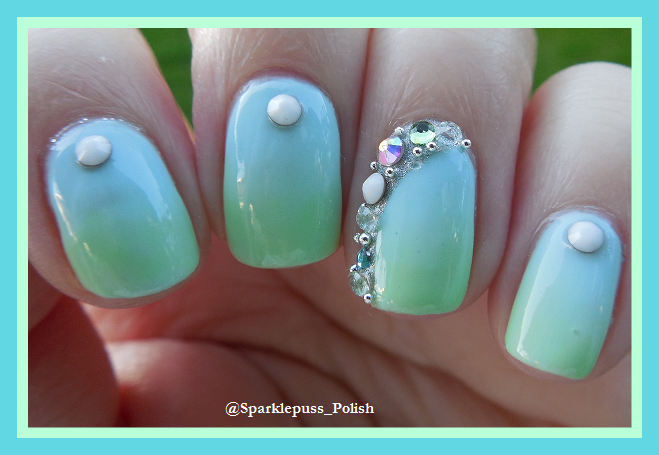 Love this color combo of glitters. Oh, I know. I wish Loaded Lacquer was still in business. I really wanted her Tornado in a Trailer Park glitter. I normally don’t gravitate toward glitter toppers, but I love the combo you did here! Thank you! I don’t buy them anymore, but this one was love at first sight. Glitter overload and I love it! Such a beautiful glitter combo! Thanks! I love this glitter! I miss Loaded Lacquer! They had some great glitter combinations. I miss them too. There were some jellies I had been lemming. What a great glitter topper! Looks perfect over the grey too. Doesn’t it? I tried a bunch on a swatch wheel and those two looked like they were made for each other. Pretty! No one makes glitters like they used to! You’re right! ILNP used to make gorgeous glitters.